Bury manager David Flitcroft has revealed he is looking to "add some spice" to his squad with loan signings. Strikers Daniel Nardiello and Clive Platt are both out injured, with defender Keil O'Brien a long-term absentee because of a knee problem. The Shakers have lost two of their last three games to slip outside the League Two automatic promotion places. Asked if he will look at loan signings, Flitcroft said: "It was something we were potentially going to do anyway." He told BBC Radio Manchester: "We've been running on a squad of 18. The two boys [Nardiello and Platt] out now take us to a squad of 16 first-team players. "We always designed it with low numbers making sure we had the quality, but I think it is quite clear we need to add some spice and competition to the group." 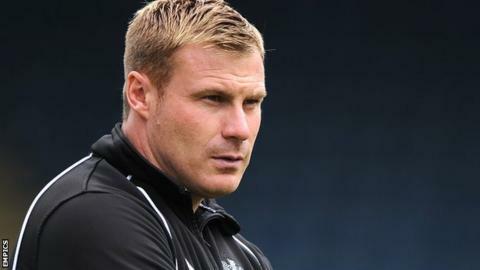 Flitcroft's side lost 5-0 at Shrewsbury in midweek, the first time the team have conceded five goals in the league since a 5-2 loss at Cheltenham in August 2010. They have now lost their last three on the road and the former Barnsley boss added: "They had more desire than us, more aggression, honesty and work ethic. "But from that I've got to assess my performance as I pick the team and the formation, so I've got to look at my part in this. "I probably did the cardinal sin of playing so well on Saturday, and then staying with the same team. "That is three results away from home that have not been acceptable - it's my job to make it not just acceptable, but to find a solution."